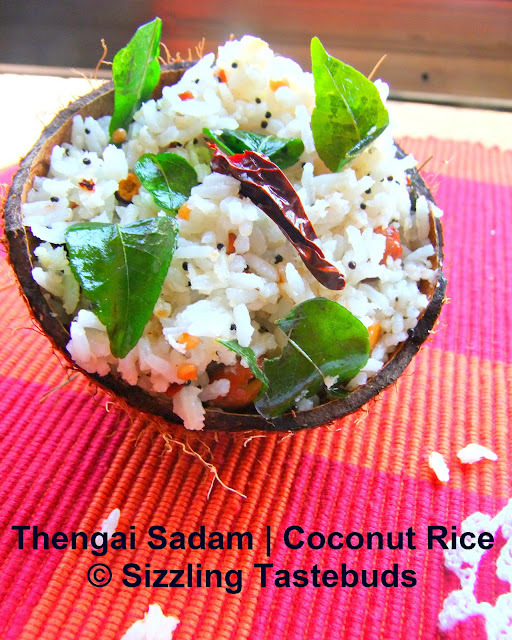 We make different flavoured rice preparations for Kanu Pongal, and Thengai Sadam is one of them. Kanu Pongal is celebrated on the 4th day of Pongal where sisters pray for their brothers welfare. Rasam is generally not prepared on this day, and the menu generally consists of different flavoured rice. If there is one defining moment of growing up in an Iyengar household, it must be about food and its aroma. Even textures come a significant second. And talking about aroma, how could I miss posting about Thengai Sadam till now.For me, personally,even Puliyodorai is not that significant (although grandmom made it for all major festivals). There is definitely something about Thengai Sadam and its unique piquant aroma that words elude me. May be an ode to this dish will be deemed necessary.. While I wax eloquent thus, I make this quite infrequently, largely owing to the fact that this dish actually takes up almost a week or two of our usual coconut consumption :-) Before I melt away in the magic of this dish, let me quickly rustle up the recipe. Every tamilian household has its own version of making it, but I followed my pati's (grandmom's) method here (I miss her a lot these days!) without using coconut milk .Come to think of it, we actually dont use coconut milk at all - even for avial / payasam, but i do sneak in a little bit for Thai Green curry (another favourite-that story,another day). We make this dish generally as a main course on certain festivals or when hosting guests (both times when you don’t count calories). 1) Wash and cook rice. Spread on a plate and fluff up a bit. Tip : It helps if you have cooked rice made ahead – the cooled rice works wonderfully well. 2) In a pan, add oil & add the ghee too. Splutter mustard, hing, urad dal, broken chillies, cashews, curry leaves and fry till cashews turn golden brown. 5) Now add the cooled and fluffed rice to the pan. Wish to have some rite now, wat a super tempting thengai saadham..
Nice pic and a wonderful treat for any day! Thanks for linking to my event! You can link as many entries as you can! Keep rocking! Delicious treat for pongal !! well presented !! 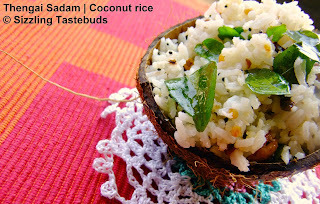 Happy new year n pongal wishes dear.Delicious rice and my all time fav rice...beautifully presented.Have a nice day! Delicious rice and beautiful presentation!! !